Hearing someone voice a regret usually saddens me deeply. Allow me a chance to explain myself further as I give a few definitions for the word ‘regret’. These definitions encompass a pretty broad range of ways to express regret, don’t they? Most of us can relate personally to the first two definitions. That can include the death of a friend or close family member. Perhaps a dear friend has moved away. It is expected that you would miss them a great deal. Is there still something you can do today to affect the long-term outcome of something you regret? That is the type of regret I am suggesting here. It can be very difficult to take that first step forward to change a relationship. Can you relate? 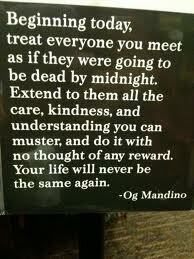 I came across this quote today from Og Mandino. It has challenged my thinking, my choices for the day, my outlook. Mandino wrote The Greatest Salesman in the World which contains the “time-tested wisdom of the ancients distilled into ten simple scrolls”. . .
Scroll I – Today I begin a new life. Scroll IX – I will act now, I will act now, I will act now. What about you? Do you have any regrets today that you still have the ability to impact, as much as it depends on you? Share some of your thoughts with me and others. When have you done this in the past? Did it bring some peace to your situation? Do you have any situations or relationships currently that you would treat differently if today truly were the last day to intervene? I would love to hear from you.